The main story in Final Fantasy XII could be summed up as the empire is taking over the world and the main party wants revenge. It evolves from there, but the main story isn’t really important for this lesson. Instead of focusing on the main story, I’m going to dive into a couple individual characters from the main party. Looking at the game from the party’s standpoint, a large part of the story deals with the past of each character. More specifically, the events the empire set in motion and how the characters deal with it. Let’s start with Vaan. His brother was killed by the empire during the invasion. His goal from then on was to take back from the empire whatever he could. Revenge was always on his mind, though oddly enough, it was usually by way of theft. Three of the other characters have similar stories. Ashe was stuck on revenge against the empire for the destruction of Nabudis, the death of her husband (the prince of Nabudis) and father (the king of Dalmasca), and the invasion and occupation of Dalmasca. Basch wanted revenge for the fall of Dalmasca. Balthier was a former judge of the empire, by his father’s doing, yet he wanted no part in what the empire was doing. Vaan was stuck in the past. He didn’t know how to deal with what had happened with his brother. Ashe and Bosch were stuck on revenge. They didn’t know how to move forward without every path leading to the destruction of the empire. Balthier was haunted by his past as a judge and his father’s transformation. He did everything he could to stay away from the empire, despite what he knew. They each clung to an event in the past to give them meaning in the present. In each case, it caused more personal harm than it ever helped. I think we, as people, often do the same. It’s easy to dwell on the past because we experienced it. The problem is, we tend to see the past as the trajectory of our future rather than learning from it to make a better future. This realization is Vaan’s turning point. The experiences leading up to this, with friends at his side, opened his eyes to what he was really feeling and where his life was heading. 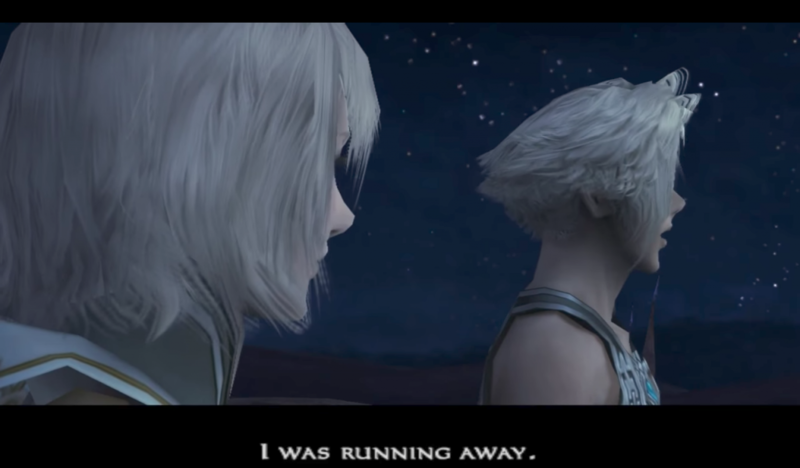 Immediately following those words, in the same scene, Vaan tells Ashe he’s done running and wants to find purpose and his own answers. Each of the characters have a similar realization at various points throughout the game. One especially important part is that none of them come to this conclusion alone. It’s through the actions and wisdom of others, along with their own realizations of where the current path leads, that brings them to a point of change. Even Ashe, who holds on to the past and thoughts of revenge for at least 90% of the game, realizes where that would lead her and the personal costs associated with it. It’s understandable to take time to process events. The death of a loved one, loss of a job or home, a divorce, etc., often leaves a person in a traumatic state. It’s good to take time to deal with the fallout from the event. However, there is a certain point where you need to pick up the pieces of your life and move forward. Otherwise, you’ll be stuck in the past, reliving the pain of bygone events while missing out on the possibilities of the future. History is a good teacher and we should learn from it, but if you cling to the past, especially painful events of your own past, it will drag you down and prevent you from moving forward. Holding on to the past can be destructive. Life is more than past events – don’t be a slave to them. Live in the present. Move toward the future. Let go of the past. 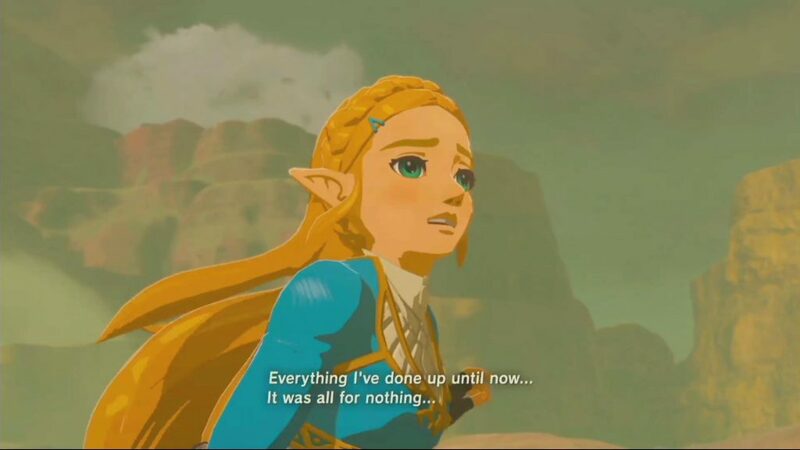 The Legend of Zelda: Breath of the Wild portrays Zelda in a very different light compared to the rest of the series, including events that lead to her questioning her very identity. Generally speaking, in previous games, Zelda was hopeful, wise (she does bear the Triforce of Wisdom, after all), and, despite constantly getting kidnapped, could put up a fight. Her character from game to game was fairly predictable. As you uncover the backstory through discovered memories, Zelda’s identity is slowly found. Of course, she’s the princess of Hyrule – that’s a given. However, the king and the people around her place an incredible burden on her because of a prophecy that make Zelda and Link the saviors of Hyrule. The first problem Zelda faces is she has no power. Despite visiting various shrines across Hyrule and offering countless prayers, nothing happens and she remains powerless. Because of this, she questions her role in the prophecy, her role in the kingdom, and to a certain extent, her identity. The second problem is the king and his expectations. He fully expects her to fulfill the prophecy without any regard for herself. Due to his attitude and treatment of Zelda, he pushes her into an anxiety ridden state where she’s constantly pushed to her personal limits – emotionally, mentally, and physically. The third problem is her own attitude, perceptions, and lack of understanding. While she desperately wants to fulfill the prophecy, she doesn’t quite get that she can’t fulfill it alone. It’s only when Link falls and is knocking on death’s door that Zelda realizes she (and Hyrule) needs Link by her side in order to fulfill the prophecy. The power isn’t hers alone, nor is it Link’s alone. I get all of this. As someone who is incredibly introspective, I often question myself on a variety of points. Why do I do the things I do? Why do I feel the way I do about certain issues? What am I supposed to be doing? What’s my purpose or calling in life? It all comes down to a single question of identity – who am I? The more I’ve pondered those questions, talked with others, read others’ accounts of their lives, followed Twitter and Facebook feeds, watched movies, and played a variety of narrative driven games, the more I’ve come to realize this is the question everyone is trying to figure out. Who am I? What’s my identity? Often times, we run into the same issues as Zelda. Not in the sense of a given prophecy, per se, but in the sense that if you don’t make a plan for your life, someone else will. I was a pastor for 7 years because of what someone else thought I should do, rather than it being the call of God. Those 7 years were filled with a lot of doubt and questions about if I was doing the right thing or doing what I was supposed to be doing. I questioned my identity quite often. I’m a teacher, by God’s gifting and calling, which is something I’ve never doubted. It’s one of the many reasons I write. The pastoral thing wasn’t my calling though – it was someone else’s idea for my life. Someone else made that plan and it sounded right (despite my own questions and doubts), so I just went along with it. The hardest part there is it was close enough to my real gifting and calling that it was easy to mix the two up. I use my own life and struggles as an example to illustrate the struggles Zelda went through, and more importantly, to let you know that no matter how you question your identity (or when someone else questions it), you’re not alone. This is a common theme in humanity. Most people spend their entire lives trying to figure out who they are. In a way, we have to. Who we are today isn’t the same as who we were 10 years ago, nor is it who we’ll be in 10 years. Our values change as we grow and learn. How we perceive the world changes as we grow. As the Bible says, and portrays over and over, we’re created in the image of God. The core of our identity is wrapped up in that statement and who God is – in His characteristics of being loving, compassionate, just, giving, and so on. However, as God is infinitely multifaceted and we aren’t perfect, the rest of our identity is ours to discover over the course of our lives. Those other facets of our identity, such as personal preferences, what brings us joy, what kind of career we’re suited for, etc, are unique to each person. Sure, there are many similarities between people, but no two people are exactly the same. Here’s the thing to keep in mind. Each part of our identity is only one small part. It’s not the whole of a person. Don’t focus on a person’s failures or the parts you don’t agree with. Ideologies you don’t agree with aren’t the whole identity of another person. Failures don’t define a person’s identity – they are merely the outcome of an action taken or not taken. One act, habit, choice, perception, or value does not make the entirety of a person. Those are a small part of a much greater whole. Zelda questioned her identity time and again, through failure after perceived failure. It was only in the end, when she realized that her power came from her desire to help and protect others, rather than fulfill some forced duty, that she discovered who she really was and what she was capable of. With that understanding of herself, she was able to save Link, hold Ganon at bay until Link recovered, and defeat Ganon alongside Link. Don’t be afraid to question yourself – it’s part of the growth process. Don’t be afraid of failures – they don’t define you. Finding your identity is a lifelong journey that won’t come easily or quickly, but it’s worth it. As you discover who you are and what matters to you, your strengths and talents align to who you truly are. In the end, the world will be better for it.